A commonly asked question among CAT aspirants is that how do we make ourselves ready for the verbal section. The answer to this question has been answered by many people, aspirants, converts, etc. Sure the answer is practice. If you practice more, you falter more, you analyse more and you improve eventually. There is one more way that could speed up the process i.e. to improve your vocabulary. Now many aspirants argue that CAT verbal has a bent towards logic and that refining our vocab will not troubleshoot the damage done to our score because of the verbal section. Let us clear this myth once and for all. Verbal and Data Interpretation sections in CAT are like 2 people who don’t make friends easily. You have to really get in there and understand them from the very basic and only after that they might wave you back with a faint smile (That is some success!!). I will focus on Data Interpretation in my future articles but for now, let us focus on verbal. As I said, in order to be friends with verbal, you need to get to know it from the very basic. In CAT’s verbal section, the majority part of it is reading comprehension. Many people from the above-mentioned categories must have advised you to read as much as you can in order to get the logical part of your brain working. Well, there is reading and it is important, but there is one more thing that will work wonders for you and that is Improving your Vocabulary. Yes, as boring as it may sound, you will be amazed by the power of vocab. Now, the idea of mugging up a word list may sound tedious and impractical (because we tend to forget words and don’t want to revise them because it is boring), But I will suggest what worked for me. I too belong to the category of aspirants who struggle with verbal and I too find the idea of mugging up a word list boring and tedious. In the world of CAT, if you are a serious aspirant, you might have definitely come across this name, “WORD POWER MADE EASY”. Yes, the small red stout book that gives you an impression of its complexity when you first look at it. Well, I had the same feeling, but I tell you, Things might not be as they seem. I was very much convinced that even though I bought this book like a true CAT Patriot, I will never be able to go beyond chapter 2 but life had different plans for me. Not only Did I finish the book(proud moment) but I did learn a lot. So this book ditches the traditional method of giving a tiring word list. Rather this book actually mentions the words in the chapters(sessions to be precise). With the definition of the word to sentence usage to the origin of the word, each session is actually concocted like a story with practice exercise in the end. Surprisingly enough, It is quite involving to the point that you don’t feel bored or under pressure. By the time you finish the book, you end up learning around 400-450 new words along with the urge to use them in the sentences and show off. I found that now when I do RCs or those 10 TITA questions, I tend to get words and form a meaning of a sentence that might have seemed to be aligned when I didn’t go through that book. Of course, there are other resources that have proven helpful in my case, like Magoosh vocab builder app. That is one more hidden gem that actually works for people with little patience like me. 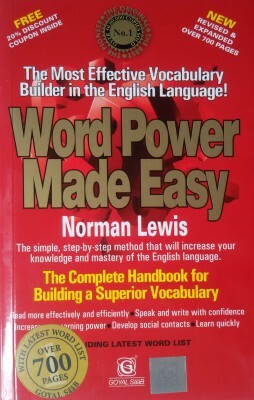 But to begin your journey towards a better verbal section, I personally think that WORD POWER is an amazing start point. It can be done simultaneously with one session a day or more than that depending upon your pace and interest, but above all, it is a great book that actually shows results when you read and absorb it(which is not that difficult, Trust me). I have completed the WPME once. But I don’t remember the words. Any Other app beneficial for words? You can revice 2 sessions per day of WPME and summerize each session in your words,not a big summary but just one page. You can try magoosh vocab builder that is very good resource for vocab. Keep on revising,that is the key.